Starbucks’ new “#sipface” campaign has made a huge splash in the Instagram world. Launched to promote the new Frappuccino Happy Hour menu, the campaign encouraged fans to post creative pictures of their “#sipface” on Instagram which were curated and displayed on Frappuccino.com. Starbucks has been ranked the “fifth-largest brand on Facebook with 34 million fans,” and has over 3.6 million followers on Twitter. Thousands of fans participated in Oreo’s latest social media campaign “Cookie vs. Creme,” which launched during the 2013 Super Bowl. This clever campaign sparked a two sided debate between fans, asking “Do you prefer the cookie or the creme?”, which ignited thousands of fan posts and replies on Twitter and Instagram. Oreo promoted the hashtags "#cookiethis" and "#cremethis," and also made sculptures out of cookie and creme which were posted on Instagram. The successful campaign grew Oreo’s Instagram community by over 17,000 followers. This trendy clothing store has taken over Instagram, Facebook, and Twitter with 832,000 followers and over 1 million fans on Facebook. They recently partnered up with Converse and launched the "Day in the Life of Your Sneakers" campaign. Fans posted videos on Vine with the hashtag "#yourchucks" for a chance to win "10 pairs of Converse, a $1,500 Urban Outfitters gift card, and two nights in Brooklyn." The partnership between Converse and Urban Outfitters was a huge success, expanding both brands’ exposure and reach on social media. Pepsi Next, Pepsi's new beverage, has been featured in their new "Wheel of Levy" campaign. Fans can visit www.wheeloflevy.com to spin the wheel and watch actor and spokesperson William Levy perform a comedic skit to the category in which the person spins on. Each skit encourages consumers to try the new Pepsi Next, and receive a coupon for a free liter of the new beverage. Fans can also share their own experiences with the campaign through social media, which has so far gotten positive reviews. Esperanza Teasdale, senior director of Pepsi Next, says the site had "over one million hits/views on the first day". Pepsi is also pushing the campaign on Facebook to over 148,000 fans. Sports giant Nike uses social media to create a personal connection with fans and provide words of encouragement. This year, the brand is using the hashtag #MakeItCount to encourage and motivate aspiring athletes. 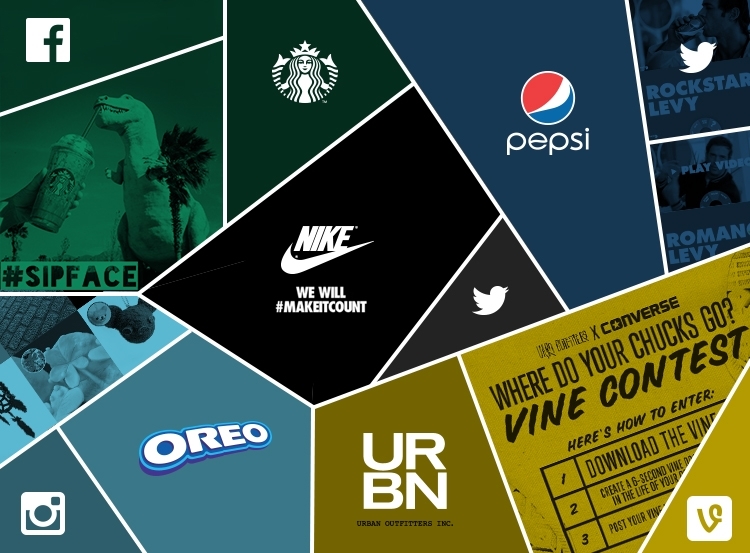 Nike segments their social media strategy with different accounts for each sport, along with managing a corporate page with over 12.3 million fans. The company also leverages their sponsored athletes by asking them to frequently “like” and “share” content on their social media accounts. Instead of focusing on campaigns or pushing product, Nike uses Twitter to build an authentic, personal relationship with fans, responding “to more than 100 tweets per day”" from their 766,000+ followers. People have become more socially connected through social media sites such as Instagram, Twitter, Facebook, and Vine and dependent on their technology devices to supply them with daily information. Nowadays, it is an absolute must that companies use this to their advantage and make themselves noticed on social media sites. This means more than simply creating each social media account. To be successful, brand social profiles should keep fans updated with recent news and events and, most importantly engage their online community. The more engaged a company’s following, the more likely those consumer fans will become brand advocates invaluable to your business’ success. Published on July 29, 2013 .